So this is my first entry for the What’s in a Name? challenge hosted by Beth Fish Reads. This is for the second category which is something you’d see in the sky and it’s also the sequel to Rivers of London. That review was a difficult one to write and this one is too – so hey, if you’ve any sympathy with the blood-from-a-stone type of trauma I’m going through here, run over and check out my new feature, Books My Boyfriend and I Have Argued About. Summary: The song. That’s what London constable and sorcerer’s apprentice Peter Grant first notices when he examines the corpse of Cyrus Wilkins, part-time jazz drummer and full-time accountant, who dropped dead of a heart attack while playing a gig at Soho’s 606 Club. The notes of the old jazz standard are rising from the body—a sure sign that something about the man’s death was not at all natural but instead supernatural. Body and soul—they’re also what Peter will risk as he investigates a pattern of similar deaths in and around Soho. With the help of his superior officer, Detective Chief Inspector Thomas Nightingale, the last registered wizard in England, and the assistance of beautiful jazz aficionado Simone Fitzwilliam, Peter will uncover a deadly magical menace—one that leads right to his own doorstep. I actually liked this one more than Rivers of London. I felt that it just made that little bit more sense somehow. The plot line is just as refreshingly different though – there’s no way you can get around Ben Aaronovitch’s unique creativity. Here, Peter gets a whiff of jazz music-flavoured magic when he examines a fresh corpse and eventually comes to the realisation that something or someone is causing the death of jazz musicians from London. Like the puppetry in the first book, it’s something I’ve never seen even a passing resemblance to before. My major problem with the first book was the lack of understandability, if that’s even a word. It just didn’t seem to flow properly. I know I wasn’t the only one who had to keep checking back just to see what on earth was going on. Moon Over Soho has much improved on that – it’s much easier to follow what’s going on. However, it still has the tendency to make my eyes absent-mindedly follow the lines of text while I’m actually thinking about breakfast cereal, or something similar. It’s only when I pause that I realise I haven’t taken anything in. It’s not that it’s boring; far from it, it just doesn’t seem to grab my attention somehow. For me, the thing that sets these books apart from the other urban fantasy books is the police-work. For once, the magician hero is working for the Police, not despite them. The author has obviously very carefully included all the detail he could about the inner-workings of the London policing system, because it’s fascinating and doesn’t disrupt the plot at all. I liked how the events at the end of Rivers of London continued on into Moon Over Soho – what happened to Lesley, I mean. I was a little afraid it would be glossed over, but obviously Mr. Aaronovitch is cleverer than that. It deals with it perfectly – it’s raw and emotional, but it’s infrequently mentioned enough to not take over the entire book. Hey, I like continuity, okay? Emotion-wise, I wanted to give Peter Grant a good slap. There are two women he’s supposed to have feelings for, and apparently cares for them both. But not in an oh-aren’t-I-a-cad-hoho way and not with any feelings of guilt… he honestly just seems to somehow forget. It’s like the other one doesn’t exist at a particular time and it’s actually very, very irritating. There’s no confusion and the story follows Peter and still doesn’t even mention it. Gnargh. It bothered me in the first book (different women) but I didn’t mention it in my review in case I was being over-picky. I know I’ve done that thing again where it seems like I didn’t like a book from the way I’m talking about it. I actually did, it’s just that are a lot of faults and I found it hard to pick it up again once I’d put it down. Despite that though, the thing that I hated the most about Rivers of London has been fixed and so I liked this one a whole lot more. Visit Ben Aaronovitch’s website here, or read my review of the first book in the series, Rivers of London. 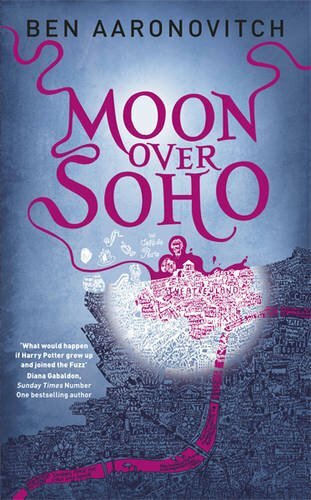 I quite liked Rivers of London but have been in no hurry to read Moon Over Soho yet. I'm sure I will some time, but so many books, so little time! All the same, glad it made a bit more sense than the last. I'm intrigued by the magician working WITH the police storyline, kinda reminds me of the Harry Dresden series (which I love). I think I will fess up to being your secret santa now…tried to find you on Twitter to spy but looks like you got the books OK! I got myself a copy of Rivers of London too and this one. I think I will wait til I have a better attention span than I have right now to read them.